Hi. My name is Pedro Miguel Coelho and I am a Brazilian student currently abroad on a year-long government programme. I’ve been studying in the Netherlands for 8 months now, in the CAH Vilentum University in the city of Almere. As a civil engineering undergraduate coming from Brazil, I didn’t know what to expect coming here, especially considering the Urban Dynamics course I came to study. I have found it to be a very special experience as it tackles a plethora of different perspectives on my subject of study, which greatly boosted my interest on it. Also, I’ve found the overall teaching to be much more creative and dynamic than the technical, content-heavy teaching that is found elsewhere. The biggest surprise I had in the Netherlands, in regards to the subject of Urban Planning, is how close the municipalities actually work with their population, in a bottom-up approach. At first I thought it was just a consequence of having a good amount of small municipalities: I come from a one-million population city which is only the 15th biggest city of Brazil, so I had a different idea of small. But after a while I could really see how the municipality/residents relationship in the Netherlands separates itself from my previous experience in my country, as I’m actually doing my company placement in the municipality of Almere. 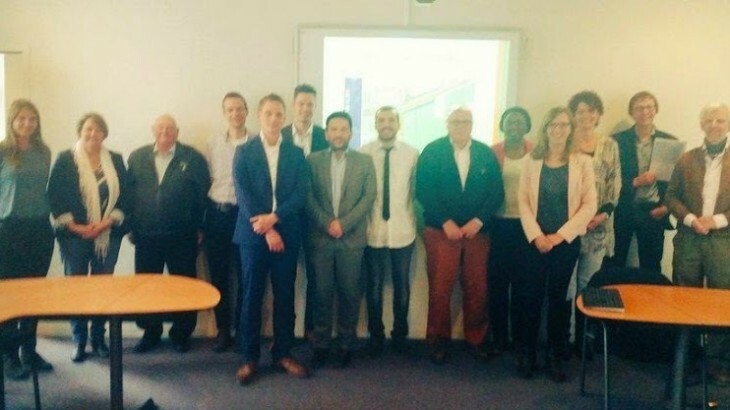 That’s how the project of Zuidbroek began, our professor, Istvan Boros, found an opportunity for us students to do a project in the city of Wierden. The four of us got in touch with the municipality and scheduled an interview so they could introduce us to the work they had for us. Turns out they had this 4 hectare area just south of the city where quite a few residents had interest in, so the idea was that we got in contact with these stakeholders, heard their ideas, and then filtered them into a project proposal for the municipality. Our objective was not exactly to come up with a design for the area, but an idea on how to make a sustainable area that would meet most of the stakeholders’ needs. We had a good meeting with the stakeholders, as a lot of them showed up and were all very motivated and willing to cooperate, showing their own takes on the project as well as using their own background experiences to complement the building of the project. Unfortunately, the interview was held in Dutch, which led the Dutch students to do most of the work conducting it as well as translating to their classmates, while the international students felt a little left out on it. However, in my experience, it was great to just be there to see and hear the actual people we were trying to do something for, as it brightened our ideas to do the work. A lot of ideas came into play, such as a green area where children could play as well as elderly people could visit, small gardens where the residents could grow their crops, an environment for beekeeping, a place where the nearby school students could have biology lessons, and especially a place where the city residents could come together. After a couple weeks of putting the project proposal into paper, we went back to Wierden to make our presentation of it. We had the presence of not only the municipality representatives, but the majority of stakeholders also took some time to go watch our presentation. The best thing about it was that after we were done, we still had an hour long discussion with the audience about the next steps the project should take from there. It was just a great overall experience for me, coming from Brazil, where the population feels so distant from decision making, aside the elections, to get together with residents and just studying the needs they still have, and the possibilities for quality of life improvement. The fact that all four students came from different backgrounds also helped enrich the quality of the work, as everyone had different input on how to improve the work, and I felt I put a little bit of my fingerprint on it. It would be extremely rewarding for me, if I could one day return to Wierden and “see the tree I help plant a small seed”.